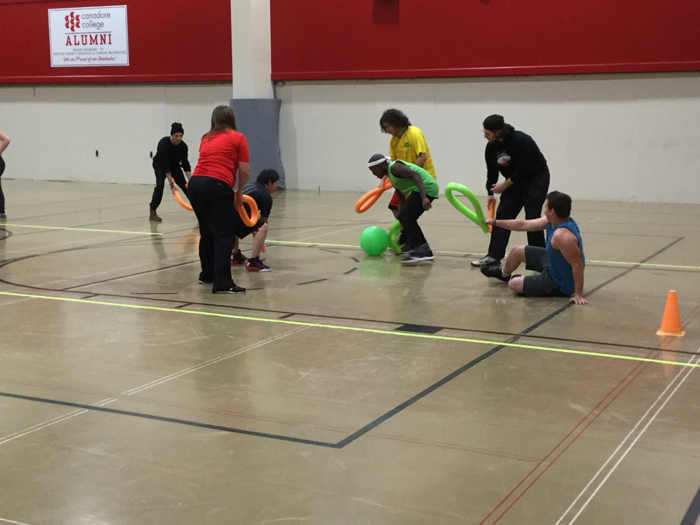 In a six week program, Canadore students are engaging Special Olympics athletes in physical activity through structured programming. Teams of students were tasked with planning a one-hour program to encourage physical activity and socialization and to market their program to participants. This week’s theme was “Oodles of Noodles”. All activities and games incorporated the use of pool noodles including noodle hockey and “protect the pin”. Leading this week’s group program was Cindy Burridge who said the experience was good because “...it’s easy to say this is how you plan but actually getting to experience it shows not everything goes smoothly so you get a chance to make in the moment decisions which I’ll use in my future career”. Second-year student Ryan Naismith has been assisting in the coordination of the K.E.M program as part of his practicum and said “It’s a great group of athletes that you can tell are having a great time. It’s great to see them happy and it makes you happy to see their enjoyment”. The K.E.M program will continue to provide programming for the special Olympic athletes over the next three weeks.